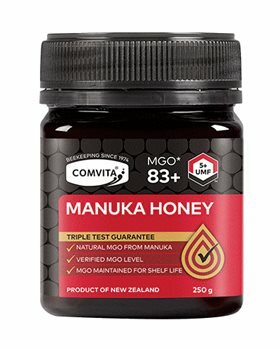 This product is made from the highest quality New Zealand Manuka honey. Handled with great care from beehive to jar to retain all its natural goodness. New Zealand Manuka Honey has long been valued for its unique properties. This honey is guaranted to be at least UMF 5+. The UMF grading system appraises natural markers found in Manuka honey, and assures purity & quality. Je l'ai seulement utiliser pour tartiner mon pain, il est bien onctueux et pas trop sucré.